Human parvovirus B19 (B19) is known to induce apoptosis that has been associated with a variety of autoimmune disorders. Although we have previously reported that B19 non-structural protein (NS1) induces mitochondrial-dependent apoptosis in COS-7 cells, the precise mechanism of B19-NS1 in developing autoimmunity is still obscure. To further examine the effect of B19-NS1 in presence of autoantigens, COS-7 cells were transfected with pEGFP, pEGFP-B19-NS1 and pEGFP-NS1K334E, a mutant form of B19-NS1, and detected the expressions of autoantigens by various autoantibodies against Sm, U1 small nuclear ribonucleoprotein (U1-snRNP), SSA/Ro, SSB/La, Scl-70, Jo-1, Ku, and centromere protein (CENP) A/B by using Immunoblotting. Significantly increased apoptosis was detected in COS-7 cells transfected with pEGFP-B19-NS1 compared to those transfected with pEGFP. Meanwhile, the apoptotic 70 kDa U1-snRNP protein in COS-7 cells transfected with pEGFP-B19-NS1 is cleaved by caspase-3 and converted into a specific 40 kDa product, which were recognized by anti-U1-snRNP autoantibody. In contrast, significantly decreased apoptosis and cleaved 40 kDa product were observed in COS-7 cells transfected with pEGFP-NS1K334E compared to those transfected with pEGFP-B19-NS1. These findings suggested crucial association of B19-NS1 in development of autoimmunity by inducing apoptosis and specific cleavage of 70 kDa U1-snRNP. Human parvovirus B19 (B19) has been associated with the development of various autoimmune disorders [1–7]. Evidences have indicated that many clinical features in patients with acute or chronic B19 infection are extremely similar to those with autoimmune diseases, including the elevated levels of autoantibodies [5, 6, 8–10]. However, the molecular basis and pathogenesis of B19-induced autoimmunity is still unclear. B19 was firstly discovered in 1975 and known as a human pathogen . The genome of B19 consists of three encoding regions including the nonstructural protein (NS1) and two capsid proteins, VP1 and VP2 [3, 12]. B19-NS1 protein has been reported to act as a transactivator of the B19 viral p6 and various cellular promoters including tumor necrosis factor-α (TNF-α) or interleukin (IL)-6 [13–16]. Additionally, B19-NS1 is known to be involved in DNA replication, cell cycle arrest and the initiation of apoptosis in erythroid lineage and non-erythroid lineage cells [17–20]. Recently, many studies also implied the roles of B19-NS1 in development of autoimmunity that could be associated with B19-NS1 induced apoptosis [16, 21, 22]. However, no further investigation was performed or reported. Apoptosis is known as a predominant cause for leakage of various autoantigens such as nucleosomal DNA, SSA/Ro, SSB/La, U1 small nuclear ribonucleoprotein (U1-snRNP) and phospholipid in patients with SLE or antiphospholipid syndrome (APS) [23–25]. The U1-snRNP complex is a common target for autoantibodies in serum of patients with SLE or mixed connective tissue disease (MCTD) [26, 27]. Previous studies have demonstrated a specific cleavage of the 70-kDa protein component of the U1-snRNP by caspase 3 and caspase 9, which is recognized as a biochemical feature of apoptotic cell death [23, 24, 28]. The cleaved 70-kDa U1-snRNP will be converted into a C-terminally truncated 40-kDa protein fragment. Additionally, high recognition of the 40-kd apoptotic fragment of 70 kDa U1-snRNP has been shown to correlate with the presence of lupus-like skin disease in patients with anti-U1-70 kDa antibodies . These findings indicated that apoptotically modified 70 kDa U1-snRNP is a candidate to drive anti-RNP reactivity in autoimmune disorders. Previously, we had firstly reported the mitochondrial related apoptosis in B19 NS1-transfected epithelial COS-7 cells, which provides alternative information for B19-NS1 protein in B19 non-permissive cells . In current study, we further investigated the effects of B19-NS1 in presence of autoantigens and found the increased specific cleaved product of 40 kDa U1-snRNP that was recognized by anti-RNP antibodies. Three volunteer in-patients from Division of Allergy, Immunology and Rheumatology, participated in this study, approved by Institutional Review Board (IRB), Taichung Veterans General Hospital, Taichung, Taiwan. All patients were infected with B19 virus and suffered from MCTD or SLE. The serum samples form the three patients contains IgG against B19 and RNP (ranges 170.5~181.4 Units). The serum samples from ten healthy individuals were used as controls. All healthy individuals and patients willing to volunteer were accepted without exclusion and diagnosis was made by a single board certified physician who is also our coauthor (Dr. Der-Yuan Chen). Plasmid pEGFP-C1 was purchased from CLONTECH (CLONTECH Laboratories, Palo Alto, CA, USA). Plasmid pQE40-NS1, containing the NS1 gene of B19, was kindly provided by Professor Susanne Modrow, from the Institute for Medical Microbiology, Universität Regensburg, Regensburg, Germany. The NS1 open reading frame was obtained by PCR by using a 5'primer (5'-GCAGATCTATGGAGCTATTT AGAGGGGTG-3') and a 3' primer (5'-GCGTCGACCTCATAATCTACAAAGC TTTGC-3') containing Bgl II and Sal I recognition sequences for subsequent cloning. Amplified B19-NS1 DNA cDNA was ligated into the Bgl II and Sal I cloning site of the pEGFP-C1 vector (EGFP). The PCR was performed with reagents containing a 0.2 μM primers mixture, 1.25 μM dNTP mixture, 1.5 μM MgCl2, 10 ng template, and 2.5 U DNA polymerase (Takara, Tokyo, Japan). The pEGFP-NS1 was then transformed into DH5α competent cells, which were obtained from Life Technologies (Life Technologies, Carlsbad, California, USA). Restriction enzyme digestion, PCR and DNA sequencing analysis were used to verify the plasmid. A previous study has indicated that cytotoxic effect of B19-NS1 was abolished by single substitutions of amino acids within the NTP-binding domain . To construct the mutant plasmid of B19-NS1, pEGFP-NS1-K334E, the QuikChange XL site-Directed Mutagenesis Kit (Stratagene, La Jolla, CA) was used to engineer a lysine to glutamic acid (K334E) mutation into the wild-type NS1 expression vector, pEGFP-NS1, with the following oligonucleotide primers: 5'-CCGCCAAGTACAGGAGAAACAAACT-3' (forward primer) and 5'-AGTTTGTTTCTCCTGTACTTGGCGG-3' (reverse primer). The PCR reaction was performed according to the manufactures' instructions. Briefly, the amplification was performed in a 50 μl reaction volume containing 10× reaction buffer, 50 ng of dsDNA template, 200 μM of dNTPs, 125 ng of each primer and 2.5 units of PfuTurbo DNA polymerase by using a Perkin-Elmer Gene Amp PCR system 2400. The PCR products were checked on a 1% agarose gel. Successful mutagenesis was verified by sequencing forwardly and reversely. COS-7 cells were originally obtained from American type culture collection (ATCC) (Manassas, Va, USA) and grown in Dulbecco's modified Eagle medium (DMEM) supplemented with 10% fetal bovine serum (FBS) (GIBCO-BRL, Carlsbad, California, USA) at 37°C in a 5% CO2 incubator. A total of 1 × 106 cells were grown to 70% confluence in 100 mm2 dishes before transfection. The transfection reaction was performed by using Lipofectamine plus reagents (Invitrogen, California, USA) with 2 μg of each plasmid, EGFP, EGFP-NS1 or EGFP-NS1K334E, according to the manufacturer's instructions. The cells were then cultured in serum-free DMEM for 12 hrs at 37°C in a 5% CO2 incubator and subsequently in DMEM with 10% FBS. The stable clones were obtained by G418 selection at the concentration of 800 mg/ml (Promega, Madison, Wisconsin, USA) in DMEM containing 10% FBS. For caspase-9 inhibition, the cells were pretreated for 12 h with 10 mM caspase-9 inhibitor (Z-LEHD-FMK) (Santa Cruz, CA, USA) and the cell lysate were then collected for Immunoblotting as described in our previous study . 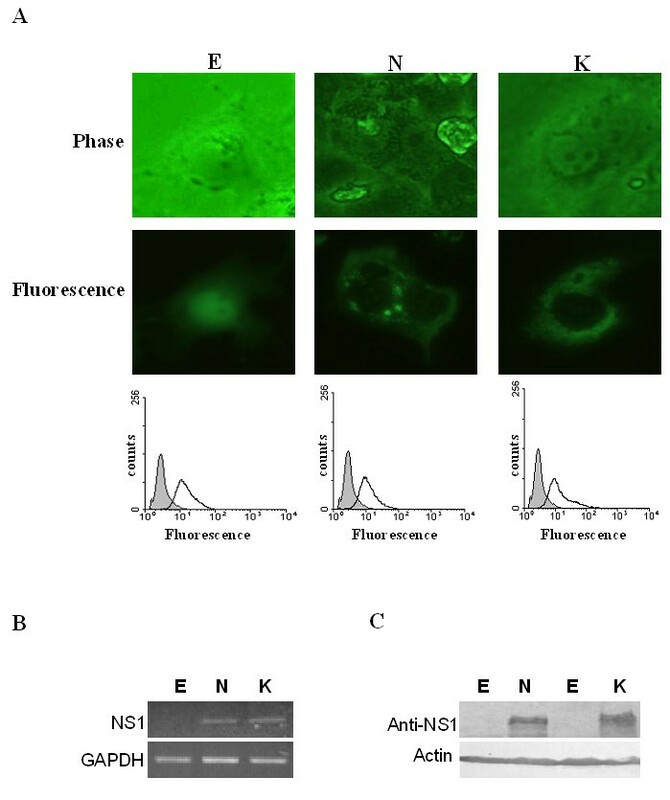 EGFP, EGFP-NS1 and EGFP-NS1K334E expression in transfected COS-7 cells were observed with a Zeiss Axioplan-2 epifluorescence microscope equipped with a fluorescence filter. Digital images of the cells were recorded by using a spot camera system. The procedures for flow cytometric analysis were the same as used previously.19 The cells (~2 × 106) were fixed in 75% alcohol for 12-16 hr at 4°C, followed by RNase (1 mg/mL) treatment at 25°C for 30 min and analyzed by a flow cytometer (FACScan, Becton Dickinson, Bedford, MA, USA). All studies were carried out in a designated PCR-clean area. RNA was extracted from infected cells using Trizol reagent (Invitrogene, Carlsbad, California, USA) according to the manufacture's instruction. Total RNA was isolated from EGFP, EGFP-NS1 and EGFP-NS1K334E expression cells. RNA samples were resuspended in diethyl pyrocarbonate (DEPC)-treated water, quantified, and then stored at -80°C until use. RNA concentration and purity were determined by a spectrophotometer by calculating the ratio of optical density at wavelengths of 260 and 280 nm. The first-strand cDNA for RT-PCR was synthesized from total RNA (2 μg) using the Promega RT-PCR system (Promega, Madison, Wisconsin, USA). The cDNAs encoding human B19 NS1 and GAPDH were amplified by RT-PCR using the following primer pairs: 5'-GGGGGGCCAGGGTTAAACCCCAGA -3' (forward primer for NS1 cDNAs, nt 694-717), 5'-CTTTAACACATGCTGCCCCACCAA-3' (reverse primer for NS1 cDNAs, nt1348-1371), 5'-CCATGGCACCGTCAAGGCTG A-3' (forward primer for GAPDH cDNAs), and 5'-TTGGCAGTGGGGACACGGA A-3' (reverse primer for GAPDH cDNAs). The amplification was performed in a 50 μl reaction volume containing 1× reaction buffer (Promega, Madison, Wisconsin, USA), 1.5 μM of MgCl2, 200 μM of dNTPs, 1 μM of each primer and 2.5 units of Taq DNA polymerase (Promega, Madison, Wisconsin, USA) using a Perkin-Elmer Gene Amp PCR system 2400. Each cycle consists of denaturation at 95°C for 1 min, annealing at 55°C for 45 sec, and amplification at 72°C for 45 sec. The RT-PCR derived DNA fragments obtained by 30 PCR cycles were subjected to electrophoresis on a 1.7% agarose gel. A caspase-3 ELISA kit (BD Pharmingen, San Diego, California, USA) was used for in vitro determination of caspase-3 activity in cell lysates according to manufacturer's instruction. The COS-7 cells transfected with different plasmids were lysed in an aliquot volume of 600 ul PRO-PREP® solution (iNtRON Biotech, Korea) for 30 min on ice. The cell lysates were then centrifuged at 15,000 rpm for 10 min at 4°C and the supernatant was isolated and stored at -80°C until use. Protein concentration was determined according to the method described by Bradford . Thirty μg of each protein sample were applied and separated onto a 12.5% sodium dodecyl sulfate-polyacrylamide gel electrophoresis (SDS-PAGE)  at 100-120 V for 1.5 hr before transferred to the nitrocellulose membranes . The membranes were then cut into strips and soaked in 5% nonfat dry milk in PBS for 30 min at room temperature to saturate irrelevant protein binding sites. Antibodies against actin (Upstates, Charlottesville, Virginia, USA), Cleaved Caspase-3 (Asp175), Cleaved Caspase-9 (Asp315) (Cell Signaling, Massachusetts, USA) and Bax, Ku70/Ku-86 (Santa Cruz, CA, USA), SSA/Ro, SSB/La, Scl-70, Jo-1 (MBL, Nagoya, Japan), Sm, U1-snRNP, CENP A and B (INOVA Diagnostics, Inc San Diego, CA, USA), and B19-NS1 [16, 19], were diluted in PBS with 2.5% BSA and incubated for 1.5 hr with gentle agitation at room temperature. The antigen-antibody was then hybridized with horseradish peroxidase (HRP) conjugated secondary antibody and detected with Pierce's Supersignal West Dura HRP Detection Kit (Pierce Biotechnology Inc., Rockford, IL). Quantified results were performed by densitometry (Appraise, Beckman-Coulter, Brea, California, USA). Statistical analysis was performed using the paired t test. Correlation between variables was assessed by Spearman's correlation coefficient and Pearson correlation. Regression parameter at 0.05 probability was considered significant. Constructions of pEGFP, pEGFP-NS1, and pEGFP-NS1K334E and the stable clones of COS-7 cells were performed as described in materials and methods. The expression of EGFP, EGFP-NS1, and EGFP-NS1K334E in COS-7 cells were examined and confirmed with fluorescence microscope, flowcytometry, RT-PCR and immunoblots. The COS-7 cells transfected with pEGFP, pEGFP-NS1, or pEGFP-NS1K334E were observed under phase contrast and fluorescence microscope (Fig 1A). Markedly green fluorescence was observed in all transfectants (Fig 1A, middle panel) as well as the fluorescence shift detected by flowcytometry (Fig 1A, lower panel). To further confirm the expression of EGFP, EGFP-NS1, and EGFP-NS1K334E in COS-7 cells, RNA and protein expressions of NS1 were examined. Figure 1B revealed the RT-PCR results of B19-NS1. Expression of B19-NS1 was detected in COS-7 cells transfected with pEGFP-NS1 and pEGFP-NS1K334E but not pEGFP. Additionally, expressions of B19-NS1 protein were detected in COS-7 cells transfected with pEGFP-NS1 and pEGFP-NS1K334E but not pEGFP (Fig 1C). Expression of EGFP, EGFP-NS1 and EGFP-NS1K334E. (A) The COS-7 cells transfected with pEGFP, pEGFP-NS1 or pEGFP-NS1K334E were observed under phase contrast (upper panel) and fluorescence microscope (middle panel). The fluorescence intensity was also detected using flowcytometry (lower panel). The (B) mRNA and (C) protein expressions of B19-NS1 were detected by RT-PCR and Immunoblottings. E, N and K indicate EGFP, EGFP-NS1 and EGFP-NS1K334E, respectively. To confirm the presence of apoptosis in COS-7 cells transfected with pEGFP, pEGFP-NS1, and pEGFP-NS1K334E, caspase-3 activity assay and immunoblottings were performed. Significantly higher activity of caspase-3 was detected in COS-7 cells transfected with pEGFP-NS1 compared to those transfected with pEGFP. In contrast, significantly reduced caspase-3 activity was observed in COS-7 cells transfected with pEGFP-NS1K334E compared to those transfected with pEGFP-NS1 (Fig 2A). Similar results were found in expressions of mitochondrial dependent apoptotic components including caspase-3, Bax and caspase-9 proteins. Significantly higher expressions of activated caspase-3, Bax, activated caspase-9 proteins were detected in COS-7 cells transfected with pEGFP-NS1 compared to those transfected with pEGFP whereas the significantly reduced levels of activated caspase 3, Bax, activated caspase-9 proteins were observed in COS-7 cells detected pEGFP-NS1K334E compared to those transfected with pEGFP-NS1 (Fig 2B, 2C and 2D). Presence of apoptosis in COS-7 cells transfected with pEGFP, pEGFP-NS1 and pEGFP-NS1K334E. 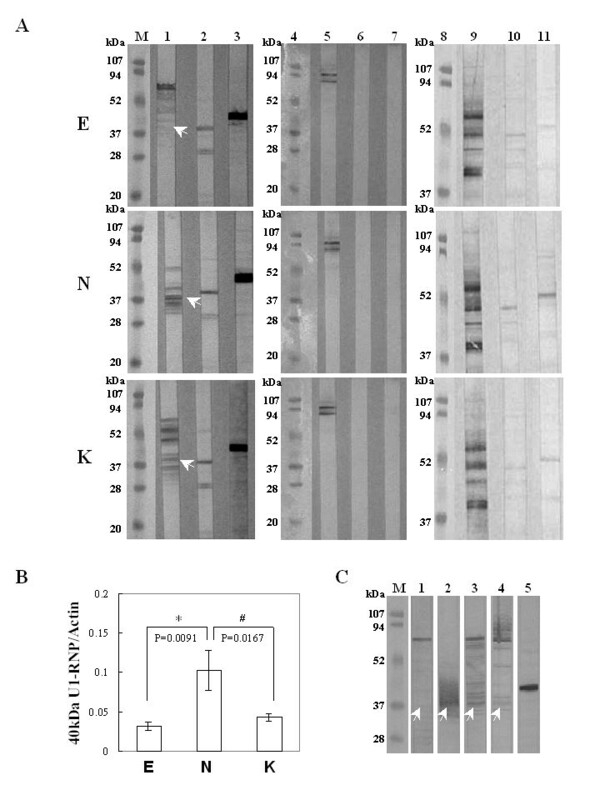 (A) The activity of caspase-3, (B) presence of activated caspase-3, (C) Bax and (D) activated caspase-9 were detected by ELISA or Immunoblottings. E, N and K indicate EGFP, EGFP-NS1 and EGFP-NS1K334E, respectively. * and # indicate significant difference as compared to E or N , respectively. Since B19-NS1 has been known to induce apoptosis and linked to the pathogenesis of autoimmune disorders, herein we further examined the presence of various autoantigens, including Sm, U1-snRNP, SSA, SSB, Scl-70, Jo-1, Ku, CENP-A/B. The presence of Sm, U1-snRNP, Ku, SSA, SSB and Jo-1 was detected in COS-7 cells transfected with pEGFP, pEGFP-NS1 and pEGFP-NS1K334E, whereas no expression of Scl-70, and CENP-A/B proteins were detected (Fig 3). Interestingly, a 40 kDa protein that was recognized by antibody against 70 kDa U1-snRNP was markedly increased in COS-7 cells transfected with pEGFP-NS1 (Fig 3, middle panel). In contrast, less presence of 40 kDa protein was observed in COS-7 cells transfected with pEGFP-NS1k334E (Fig 3, lower panel and 3B). Additionally, the 40 kDa U1-snRNP in COS-7 cells transfected with pEGFP-NS1 was markedly reduced in the presence of caspase-9 inhibitor (Fig 3C). Meanwhile, significant correlation was found between caspase-3 activity and 40 kDa U1-snRNP/actin ratio in COS-7 cells transfected with pEGFP-NS1 (Fig 4A, r = 0.82). Meanwhile, caspases-9 activity was also significantly correlated to the 40 kDa U1-snRNP/actin ratio in COS-7 cells transfected with pEGFP-NS1 (Fig 4B, r = 0.89). To further verify the association among the cleaved 70 kDa U1-snRNP, B 19 infection and autoimmunity, serum samples from 3 different B 19 infected patients with MCTD or SLE were used to detect the U1-snRNP in COS-7 cells transfected with pEGFP, pEGFP-NS1 and pEGFP-NS1K334E. The presence of 40 kDa U1-snRNP was recognized by all serum samples in pEGFP-NS1 transfected COS-7 cells (Fig 5). Cleavage of 70 kDa U1-snRNP in COS-7 cells transfected with pEGFP-NS1. (A) Expression of various autoantigens including 70 kDa U1-snRNP, Sm, Ku, CENPA/B, Scl-70, SSA/Ro, SSB/La and Jo-1 (lane 1-2, 5-7, 9-11) were detected in COS-7 cells transfected with pEGFP, pEGFP-NS1 and pEGFP-NS1K334E by various antibodies. Actin is used as control (lane 3) and arrow indicates a cleaved 40 kDa U1-snRNP protein. 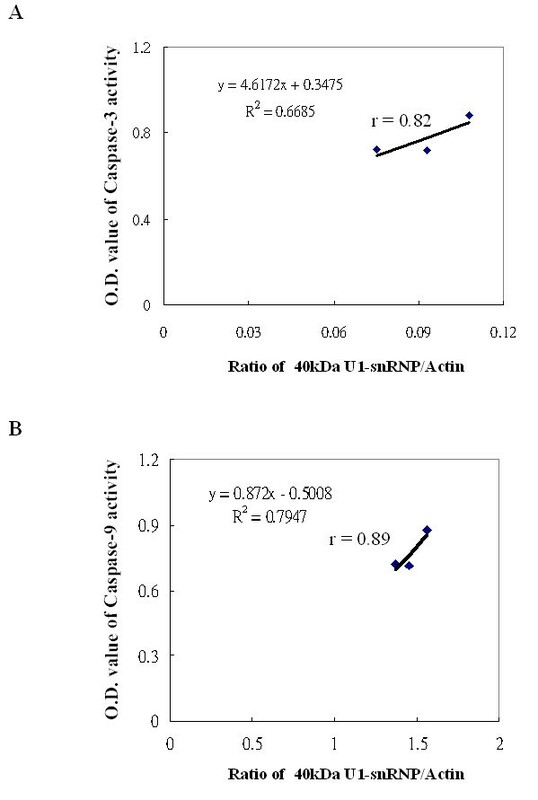 (B) Ratio of 40 kDa U1-snRNP to actin. (C) The presence of 70 kDa and 40 kDa U1-snRNP were detected in COS-7 cells transfected with (lanes 1 to 4) pEGFP, pEGFP-NS1, pEGFP-NS1K334E and pEGFP-NS1 with caspase-9 inhibitor by antibodies against U1-snRNP. (Lane 5) Actin is used as control. Three independent tests were performed. * and # indicate significant difference as compared to E or N, respectively. E, N and K indicate EGFP, EGFP-NS1 and EGFP-NS1K334E, respectively. 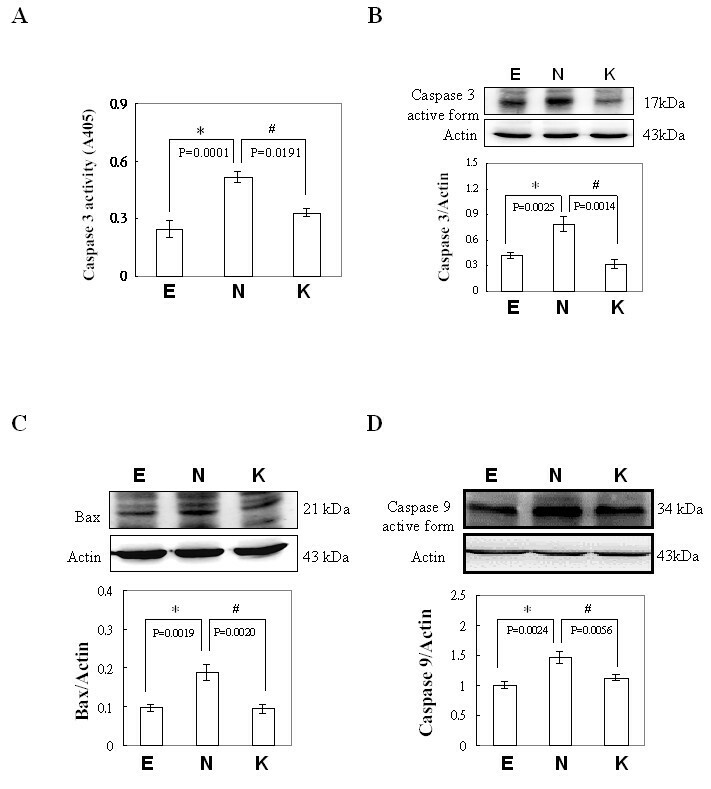 Correlation of (A) caspase-3 activity and (B) caspases-9 to the 40 kDa U1-RNP in COS-7 cells transfected with pEGFP-NS1. Recognition of U1-snRNP in COS-7 cells by serum from patients with B19 infection. (A) Presence of 70 kDa U1-snRNP and its cleaved 40 kDa-form in COS-7 cells transfected with pEGFP, pEGFP-NS1 and pEGFP-NS1K334E were detected with serum from B19 infected patients. Lanes 1 to 3 indicate serum from 3 different patients with B 19 infection. Actin is used as control (lane 4). Lanes 5 to 6 indicates representative results of serum samples that were randomly selected from the 10 healthy individuals. (B) Ratio of 40 kDa U1-snRNP to actin. Three independent tests were performed. * and # indicate significant difference as compared to E or N, respectively. E, N and K indicate EGFP, EGFP-NS1 and EGFP-NS1K334E, respectively. Human parvovirus B 19-NS1 has been known to induce apoptosis that may contribute to the development of autoimmunity. However, no further evidence about the mechanism was reported. In current study, we reported the significantly increased cleaved 40 kDa-U1-RNP in COS-7 cells transfected with pEGFP-NS1 compared to those transfected with pEGFP. In contrast, significantly reduced 40 kDa-U1-RNP product was observed in COS-7 cells transfected with pEGFP-NS1K334E as well as the apparently reduced caspase-3 activity and apoptosis. Apoptosis is a leading cause of autoantigens, which have been increasingly recognized as crucial targets of autoantibodies across a broad spectrum of autoimmune disorders such as SLE and antiphospholipid syndrome (APS) [23–25]. Previously, B 19-NS1 has been reported to play crucial roles in cell cycle arrest and apoptosis in both erythroid lineage cells [17, 18] and non-erythroid lineage cells [19, 20]. A recent study also reported that over-expressed B 19-NS1 triggers activation of caspase-3 and degradation of Na+/H+ exchanger, which may contribute to apoptosis and thus participate in the pathological process . Besides, the cytotoxic effect of B 19-NS1 can be abolished by a single substitution of amino acids within the NTP-binding domain  and has been directly related to the induction of apoptosis [35, 36], which was used as a negative control of B 19-NS1. Although these findings have demonstrated the association between B19-NS1 and apoptosis, however, no evidence is provided about the effect of mutated B19-NS1 on apoptosis. In this study, we revealed the significantly increased apoptosis in COS-7 cells transfected with pEGFP-NS1 compared to those transfected with pEGFP. In contrast, significantly reduced apoptosis was observed in COS-7 cells transfected with pEGFP-NS1K334E compared to those transfected with pEGFP-NS1. These data suggest that B19-NS1 induced apoptosis is probably associated with the cytotoxic effect of B19-NS1. However, further investigation is still needed to verify the details. Growing evidences suggest that deregulation of apoptosis is involved in development of autoimmunity. Indeed, various apoptotic cell antigens, including fragmented endoplasmic reticulum, ribosomes, ribonucleoprotein, nucleosomal DNA, SSA/Ro, SSB/La, and small nuclear ribonucleoproteins, have been recognized as targets of autoantibodies across a broad spectrum of autoimmune diseases [23–25, 37]. Moreover, various autoantigenic proteins are cleaved during apoptosis by caspases, a family of cysteinyl asparate-specific proteinases [37, 38]. The specific 70 kDa U1-snRNP protein is known as an autoantigenic protein for autoantibodies in serum from the patients with SLE or MCTD [26, 27]. The specific 70 kDa U1-snRNP, cleaved during apoptosis by caspase 3 [23, 24] and caspase 9  and converted it into a C-terminally truncated 40 kDa protein fragment. High recognition of the 40-kd apoptotic fragment of U1-70 kDa has been shown to correlate with the presence of lupus-like skin disease in patients with antibodies against 70 kDa U1-snRNP [29, 39, 40]. Thus, apoptotically modified 70 kDa U1-snRNP antigen is considered as a candidate to drive anti-RNP autoimmunity in lupus. As shown in current study, significant increase of cleaved 40 kDa fragment from the specific 70 kDa U1-snRNP protein was observed in COS-7 cells transfected with pEGFP-NS1 but not in those transfected with pEGFP-NS1K334E, which has high correlations with increased caspase-3 and caspase-9 activities. Since the serum from B19 infected patients with MCTD or SLE recognized the B19-NS1-induced cleavage of 70 kDa U1-snRNP, however, it could suggest the association between B19-NS1 induced cleavage of 70 kDa U1-snRNP by B19-NS1 and autoimmunity. Although the precise role of NS1 in inducing autoimmunity is still obscure, here we firstly report the increased cleaved 40 kDa RNP is associated with B19-NS1 and recognized by B19 infected patients. that has been recognized as an indicator for development of autoimmunity. Altogether, we have indicated that B19-NS1 induced apoptosis is probably associated with the cytotoxic effect of B19-NS1. Additionally, the B19-NS1 induced apoptosis leads to a specific cleavage of 70 kDa U1-snRNP and is suggested to play crucial roles in development of autoimmunity. This study was supported by the grant NSC 95-2314-B040-010 and NSC 98-2314-B040-008 MY3 from the National Science Council, Taiwan, ROC. BST conceived this study, drafted the manuscript, and performed the statistical analyses. CCT performed the Immunofluoresence, RT-PCR and Immunoblotting. DYC and SYC provided material support and encouragement for this work. TML performed the Immunoblotting. TCH provided material support and direction, drafted significant portions of the manuscript, and performed the Immunofluoresence, RT-PCR, flow cytometric analysis and Immunoblotting. All authors read and approved the final manuscript.